The Embedded Citizen: VP Rice? According to ABC News US Secretary of State Condoleezza Rice is now pursuing the job as Vice President. Speculations started after Rice visited The Americans for Tax Reforms Wednesday meeting with conservative leaders ten days ago. 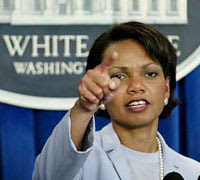 So far many analysts have dismissed Rice for VP, because of her close bonds with President Bush. On the other hand, some think it might be a waste of time to introduce someone less known – having to educate the American public about who that person is.